No longer does filming on your phone mean a compromise in quality: network TV documentaries, breaking news reports and indie feature films – not to mention a huge chunk of YouTube and other online content – are all now being produced using the small sensors in our smartphones. The iPhone’s stock Camera app is competent at capturing basic movie clips, but even the latest iPhone 7 and iPhone 7 Plus, running iOS 10, offer few opportunities for those with exacting requirements, or who simply want to get more creative. Naturally the App Store has hundreds of options that promise to push the iPhone camera’s capabilities, but finding the best can take time and cost money. That’s where TechRadar can help. If you like your images still, as well as moving, then check out TechRadar’s 10 awesome iOS camera apps feature too. Promising to pack ‘professional film production tools into your iPhone’, MAVIS is one of the videography apps calling the shots in the App Store right now. Aping all the knobs and dials of a full-fat broadcast camera, MAVIS couldn’t be further from the bare-bones stock iOS app if it tried. Its features include a slider-controlled focus ring and configurable peaking for smooth focus-pull effects. There are manual white balance, exposure and zebra options to avoid hot-spots; vector scopes, waveform and audio monitoring are welcome too, as is the ability to shoot 4K footage (even on an iPhone 6 – with limitations). Frame rates can be customised from three to 120fps in 1080p Full HD, with up to 100 Mbps quality. To non-video professionals the interface may appear daunting at first; however a single tap on the full-screen icon hides all but the basic functional controls. That said, if you’re paying this professional-grade price you’ll want to be sure you’re taking advantage of its professional-grade features. The iPhone camera is an incredibly powerful piece of equipment, yet few apps exploit its video capture capabilities as fully as MAVIS. Alongside the VHS Camcorder app’s basic conceit of degrading video from your state-of-the-art 4K-capable smartphone to mimic that of a 35-year-old consumer camcorder, there’s a level of detail here that’s admirable. Not only is the ‘80s video effect superbly authentic, but everything from the multi-colour filter to the ‘Tilting Makes Thing Worse’ switch (tracking on VHS cassettes was notoriously sensitive) is reproduced in loving detail. There’s even a blocky on-screen title editor and a ‘Spoof the Recording Date’ mode. Although the retro look may grow tiresome, VHS Camcorder is proof that nostalgia really is everything it used to be. Hyperlapse isn't a new addition to the App Store shelves, but the Instagram spin-off does still offer creative types a simple and remarkably effective way of telling a story in video. The free app has two killer features: its timelapse lets you shoot first and speed up later, and Instagram’s in-house stabilisation does a stellar job of removing handheld wobble. The result is a video clip that squeezes an entire sunrise, walk to work, or plane take-off into a few seconds, with the signature silky smooth Hyperlapse look. Sharing to Instagram isn't mandatory, and clips are saved to your camera roll by default. 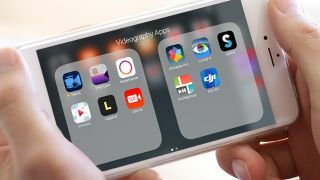 If you're looking to stabilise video clips that you've already filmed then look no further than Emulsio, as professional a tool as you're likely to need for getting rid of shaky shots on iOS. Compensating for horizontal, vertical and rotational camera movement along with wobble distortion, Emulsio gives you options aplenty to tweak its effect, and lets you live-preview with and without the effect in split screen. The results are Steadicam-smooth but, depending on the amount of compensation applied, noticeably cropped: experiment with framing shots slightly wider to give latitude for later stabilisation. Adding titles and captions to your video can put the professional cherry on top, but getting the right look and animation can be time-consuming and frustrating. Step forward Legend and Gravie. Legend (£1.49 / US$1.99 / AU$2.99) provides three pages of dynamic templates for screen-filling titles. It's simple to use, and the results are certainly eye-catching. Legend’s default looks are good but customisation is limited, and the square output is best suited to social media. The ability to export to animated GIF does deserve an Oscar though. Gravie (£1.49 / US$1.99 / AU$2.99) also starts you off with templates, but soon reveals itself to be a sophisticated editor, allowing you to customise animations, typeface, size and colour. Cutting and combining clips is also supported, as is overlaying music tracks from your local stash; there’s even a vector art library. Legend is a great app for a quick title fix to help make a splash on social media; Gravie may take a while to master, but does offer more scope for creativity. LumaFX does video and audio manipulation tasks better than most: video can be resized, reframed, reversed, rotated and mirrored, clips sped up or slowed down while maintaining pitch, and audio levels adjusted throughout the length of a movie. Were this all it did, LumaFX would already be an invaluable addition to any iOS videographer’s ‘Useful Tools’ folder. However, tapping on the Color & Effects tab lets the LumaFX genie out of the bottle, revealing packed palettes of colour-graded looks, blurs, vignettes, and distortion – almost every effect a visual FX professional might wish for on a smartphone is here. What's more these can be stacked, reordered and individually adjusted, with each separate effect and setting individually supporting keyframe animation. This Aladdin’s cave of creative options elevates LumaFX from a trusty video fix-it app to a supremely powerful and flexible VFX tool. Pinnacle Studio Pro is currently the closest iOS filmmakers can get to traditional desktop editing software – the original version was sold by industry giant Avid, whose Media Composer suite cut blockbusters including The Martian and Star Wars: The Force Awakens. It’s easy to see that starry heritage passed down here: Pinnacle Studio Pro is a rich and precise video editor, with many features a professional might be surprised to find in a consumer app. Integration with cloud services means video clips can be pulled in from Dropbox, Google Drive and Box, as well as from your camera roll. Rearranging clips on the timeline is a simple drag-and-drop affair, as is adding animated titles and transitions from the healthy library provided. There are multiple audio tracks – although sadly still not multiple video layers – plus a real-time sound mixer with the option to record a voiceover in-app. As a universal app Pinnacle Studio Pro works on the iPhone but really comes to life on the iPad, making the most of the additional screen estate and simplifying precise gestures and interactions. It’s worth pointing out that a slightly cheaper non-‘pro’ version of Pinnacle Studio is available, which drops support for 4K video processing, audio mixing and a handful of other features. Why show just one clip on screen when you can play a handful at once? That's the question posed by collage composition app PicPlayPost. As many as nine videos, GIFs and stills – not to mention Apple’s Live Photos from iOS 9 onwards – can all be pinned into a customisable frame. Individual videos within the collage can be looped, played all at once or in sequence, making for, say, a cartoon strip-style film. PicPlayPost can also help breathe life into stills, combining them with video and music. What at first may appear a basic app can very quickly become an efficient social media storytelling tool. Tapping share lets you publish your creation to your camera roll and various social networks as a movie file, animated GIF or Live Photo. Another one mainly for making a splash on social media, PicPlayPost is a free download, with in-app purchases to unlock custom frames and watermark editing. Tired of trawling your local App Store aisles for an easy-to-use editor that lets you cut clips with quick results? Hidden somewhere between the frozen food and the pasta shapes is Splice – and it might just be the deal of the day. Splice cuts out the fiddly stuff from smartphone video editing, but manages to add some refined features for those with more time. Select clips to add to your basket, making sure to highlight any favourite moments, pick up a theme, grab a soundtrack, scan through some basic settings, and then check out Splice's automatically generated edit. Anything you're not fond of can be trimmed or changed, and transitions, along with basic colour grades and titles, can be layered on top. This app might look familiar to some under another name, but is now owned by GoPro, a firm with a vested interest in making video editing and sharing a pain-free process. No surprise, then, that Splice now integrates with the GoPro Plus cloud, so action cam owners can import and edit footage filmed away from their phone. Uniquely, Splice can also grab footage from Facebook and Instagram profiles, as well as from Dropbox and Google Drive. Let’s name the elephant in the room, shall we? The DJI Osmo Mobile is very obviously not an app, so what is it doing here in an iOS videography app round-up? We hear you –and “simply because it’s the best way of capturing professional-quality video on your smartphone and we would be insane not to shoehorn it in here” is our confident response. That, and the fact that there is technically an accompanying DJI GO mobile app – but that’s of little consequence here. If camera wobble is the disease of great-quality video, then the Osmo Mobile’s 3-axis gimbal is the super-vaccine. Simply slip your smartphone into the spring-loaded grip, power-on the Osmo Mobile and marvel at how physics and tech conspire to make magic happen in your hand, your phone gracefully levitating to create silky-smooth cinematic shots. A follow-me feature even lets you select a subject – which could be you in your phone’s selfie mode – which the Osmo will automatically keep in frame, wherever you or it goes. DJI has form in this market: its Inspire drones are now a TV staple for aerial footage, while its Ronin and original Osmo stabilisers are well-established on set as well. With the Osmo Mobile, DJI acknowledges that smartphone cameras are capable of pro-quality capture too. Now you've got a great video camera, use it to become a master of Facebook Live with our guide.